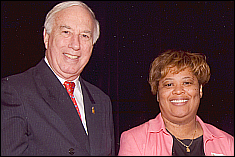 Debora Chandler was presented with an award by President C.D. Mote at this year's Service Award Banquet. The Department of Aerospace Engineering, in conjunction with the University of Maryland, would like to thank Debora Chandler for thirty years of service. This is an admirable accomplishment for any member of our campus community to achieve. Ms. Chandler's commitment has been unwavering and we are proud to call her one of our own. In recognition of her 30 years of service, Debora was presented with an award by President C.D. Mote at this year's Service Award Banquet.